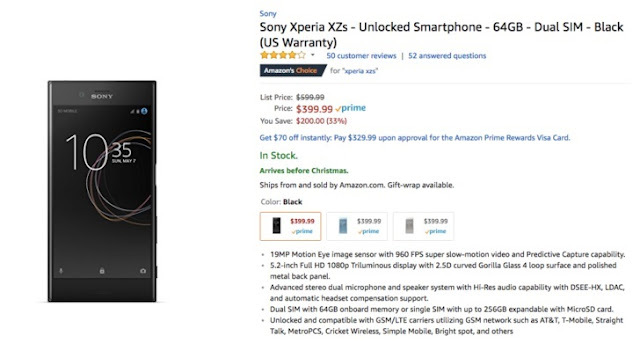 Only 6 months old Sony Xperia XZs, which had a introductory price tag of $700, is now costing only $400 in the USA. As of this moment, Amazon has the handset listed for that price. If you're planning on shooting some seriously slowed-down videos, this Sony phone can shoot 960fps video. It has a 5.2" 1080p display, a Snapdragon 820, 4GB of RAM, 64GB of storage, a 19MP 'Motion Eye' camera, a 13MP front-facing camera, and a 2900mAh battery. It's also IP68 water-resistant and can take two SIMs at a time. Three colors are available: Black, Ice Blue, and Warm Silver. Amazon is offering all three colors at this low price with free shipping.